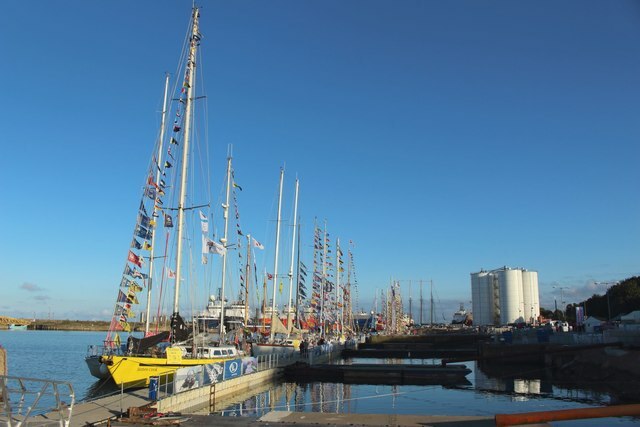 "Temporary pontoons have been built in Hudson Dock to allow a large number of small tall ships to berth within the facility during the 4 day event around the start of the Tall Ships Races 2018 which was being held in Sunderland. Public were allowed access to the quayside areas on the west side of Hudson Dock during the event and were allowed access to the floating pontoons to which the boats were tied in small numbers so they could get a close look at the ships taking part." Photo by Graham Robson, 2018.